Sister Berneice Loch rsm OAM has been elected as the new President of Catholic Religious Australia (CRA) at the 2014 CRA National Assembly held in Melbourne on 23-27 June 2014. 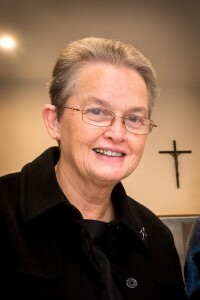 Sr Berneice is currently Leader of the Institute of Sisters of Mercy of Australia and Papua New Guinea (ISMAPNG) and received the Medal of the Order of Australia (OAM) in 2013.
Notable among her leadership achievements was her central role in the establishment of Mercy Partners (2004-2011) and more recently the Institute of Sisters of Mercy of Australia and Papua New Guinea. She replaces Sr Annette Cunliffe rsc who has served the two-year term of the CRA Executive Council. At a speech to Assembly participants where she expressed thanks for their support and confidence, Sr Berneice honoured the outstanding leadership of her predecessor. “You have held the position with grace and with a very light touch which has probably been very appropriate for the times you needed to lead this conference, particularly to the challenge of the Royal Commission,” she addressed Sr Annette. Sr Annette acknowledged the support from CRA members and office staff during her term as President. “I would like to say thank you and I would like to say that I have absolutely every confidence that Berneice would do us even more proud,” she said. The tributes and congratulatory mood provided a fitting end to this Assembly which featured Cardinal João Braz de Aviz, the head of the Vatican’s Congregation for Institutes of Consecrated Life and Societies of Apostolic Life, Sr Carmen Sammut msola, President of the International Union of Superiors General (UISG) and Archbishop Paul Gallagher, Apostolic Nuncio to Australia. Their global perspective on the future and nature of religious life informed the issues that are currently faced by Congregation Leaders in Australia and New Zealand which were discussed widely at the Assembly. Lay partners from various ministries and Mr Francis Sullivan, CEO of the Truth, Justice and Healing Council, also gave talks at the Assembly on partnership in mission. Sr Berneice will be supported by the following members of the Council: Fr Tom McDonough cp, Sr Sally Bradley rsm, Br Jeff Crowe fms, Fr John Mulrooney msc, Sr Monica Cavanagh rsj, and Sr Megan Brock rsj. State Representatives on the Council are Sr Annette Arnold rsj (Queensland), Sr Stancea Vichie mss (Victoria), Sr Ruth Durick osu (NSW), Sr Bernadette Kiley op (South Australia) and Sr Marie Therese Ryder fndn (Western Australia). Media contact: Giselle Lapitan media@catholicreligiousaustralia.org.au or +61 434 409 333. This entry was posted in Uncategorized on July 1, 2014 by Mark Wei.